As the Gibraltar Football Association (GFA) prepare for their long-running application to join the international game to go to a vote at the UEFA Congress in London on May 24 2013, author and journalist Steve Menary provides an update on the fortunes of the British colony and the other teams that featured in his critically well-received book Outcasts: The Lands That FIFA Forgot. He looks at what has happened to those teams that he spent two years chronicling in the original edition of Outcasts, which was shortlisted for the 2008 football book of the year award. Why could Gibraltar finally be on the break-through? Why is Greenland the epitome of the footballing Outcast? Why are Kosovo barred from even playing international friendlies despite recognition from well over half of FIFA’s 209 members? 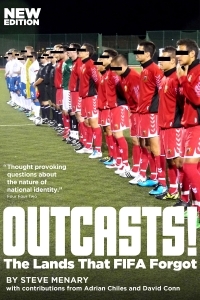 Outcasts, which has just come out as a new edition on Kindle, is a story of how footballing nationality, or the need to establish a national identity through sport, continues be used and distorted for political means, and how the footballing authorities keep some ‘countries’ kicking their heels on the side-lines. “Where is the soul of football? I think it’s in this book” – Adrian Chiles. Preface to Outcasts. “For readers who want to know their writers have given them 100%, there will be no doubts here … an absorbing, engaging and thought provoking account of the miracle which is football itself” – David Conn. Introduction to Outcasts. Steve Menary trained as a chef but since 1996 has worked as a journalist. He was a city reporter at The Scotsman before becoming a freelance writer and author in 2001. He writes mostly about business and sport and is a regular contributor to World Soccer and When Saturday Comes magazines. He also contributes to PlayTheGame.org and the World Football show on BBC World Service. He has been saddled with supporting AFC Bournemouth for as long as he can remember.